When Maria Anna of Savoy married King Ferdinand V of Hungary, she knew the difficulties she would have to endure, not only of becoming the consort of the unpopular Habsburg ruler, but more so because of the condition of the groom. Ferdinand was reviled for his feeble-mindedness and incapacity to rule primarily because he was epileptic. So terrible was his condition that he suffered from as much as twenty seizures a day! 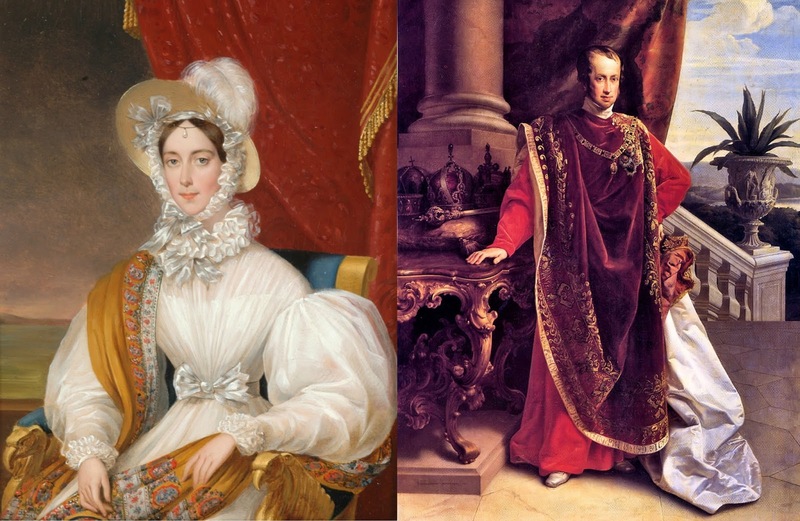 On February 12, 1831, Maria Anna and Ferdinand married by procuration in Turin, Italy. Fifteen days later, they were married in person in Vienna. Alas, Ferdinand’s condition prevented the couple from having a child. Once when they tried to consummate their marriage, he suffered from five seizures. In 1835, Ferdinand succeeded his father as Emperor of Austria with Anna Maria as the new empress-consort. But Ferdinand was a ruler in name only. A council composed of his uncle, Archduke Louis, Count Kolowrat and Prince Metternich, managed the government's day-to-day affairs. At the height of the revolutions that spread like wildfire in Europe in 1848, the Habsburgs were forced to flee Vienna. Twice they had to escape and on December 2, 1848, Ferdinand abdicated in favor of his nephew, Franz Ferdinand. Maria Anna was relieved. Finally, the couple left the court and settled in Prague, where they lived in peace and spiritual pursuits. Their relaxed lifestyle gave Maria Anna more time to do two things she loved the most: eating and praying. They spent summers in Reichstadt or Ploskovice (in what is now the Czech republic) and moved to Prague Castle on winters. A devoted wife, she nursed Ferdinand through the toughest moments of their lives, touching everyone with her sincerity and love for him. She mourned Ferdinand's death in 1875, and when her time came to follow him, her meekness and piety was unforgotten by the locals of Prague who was saddened by her passing. Maria Anna Ricciarda Carolina Margherita Pia was born in Palazzo Colonna in Rome on September 19, 1803. Her father was King Victor Emmanuel I of Sardinia, while her mother was Archduchess Maria Teresa of Austria-Este. She died in Prague on May 4, 1884 at the ripe age of 80. Franz Josef, not Franz Ferdinand.